This stylish chair can be used for multiple occasions. Its made to be very durable and is also weight tested. Choose from great fabric ranges to mix and match to suit your brand colours. 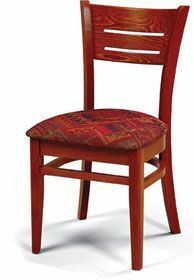 Elegant design and sturdy construction, solid wood Beech finish dining chair. Available also as a wood seat option.